It looks like the Tiffany Network is going low-carb. 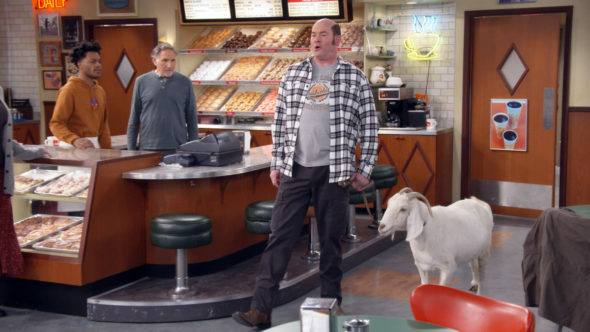 CBS has cancelled its Superior Donuts TV show after two seasons. The comedy was never a Nielsen darling and barely eked out a renewal last year, so this cancellation was expected. A CBS sitcom, Superior Donuts stars Judd Hirsch, Jermaine Fowler, Katey Sagal, David Koechner, Maz Jobrani, Anna Baryshnikov, Darien Sills-Evans, Rell Battle, and Diane Guerrero. The story centers on an old school Chicago donut shop owner, Arthur Przybyszewski (Hirsch), who is loath to keep up with the changing times. He begrudgingly hires Franco (Fowler), a young, self-starter who tries to persuade Arthur to bring the shop into the 21st Century. The second season of Superior Donuts is averaging a 0.89 rating in the 18-49 demographic and 5.094 million viewers. Compared to season one, that’s down by about 23 % and 18%, respectively. By both measures, Superior Donuts, season two, has been among the lowest rated scripted CBS TV shows. All told, today CBS cancelled two TV shows: Superior Donuts and Scorpion. The network also renewed five series: Criminal Minds (season 14); Man With a Plan (season three); Life in Pieces (season four); Instinct (season two); and Big Brother: Celebrity Edition (season two). UPDATE: CBS has cancelled Kevin Can Wait and has renewed Elementary for season seven. Deadline has confirmed the Superior Donuts cancellation. What do you think? Did you like the Superior Donuts TV series? Did you think CBS would cancel or renew it for season three? I loved Judd hirsch and superior donuts. I loved the issues it tackled and would have loved for it to come back. It would have been interesting seeing faz as a boss and seeing Arthur change. Why did they cancel a good show? I really like man with a plan i’m So glad you didn’ t cancel the show. It’s so funny. I really liked Superior Donuts it was really funny. I wish you haven’t canceled it. Every time I really enjoy something you all cancel it. we love the family show, sadly some eposides hit a 10 and some were only a 6 which is why it is canceled. I would recommend another season. This wasn’t a terrible show, it was actually better than I was expecting. The writing was on the wall tho once Judd Hersch’s character said he was closing the shop to go live his life. And they got the guy and the food truck girl together as well. At least it was a proper ending to the series. I loved this show. It was very funny. The entire cast cracked me. Loved seeing judd Hirsh and Jermaine Fowler together. I wish the show was on longer. I’m sad you canceled. Cute show. Great cast. Chico and the Man for the 21st Century. My wife and I watched this every week. We thought it was very funny and are disappointed to hear it’s been cancelled. This was the best comedy on CBS. It’s was the “All in the Family” for this time period. In a time when political correctness, has ruined this Country, this show was a breath of fresh air. Why in the world would they cancel it? It was such a great show, cute and funny, and my favorite show on TV. Now there’s literally nothing else on worth watching. I liked it better than Big Bang Theory, that’s about the only other one I bother to watch. Please reconsider. I enjoy the show although I am slightly higher in the (18-49) age group coming in at 54. It is a good show of people with different ethnic backgrounds working together and friendships. I think more people would benifit from watching this show being the world like it is. Thank you for you time in reading this. My husband and I NEVER agree on tv shows but we both LOVE this show. Please reconsider cancelling. I wish it was on longer. Please reconsider.